Leicester City manager Nigel Pearson insists he is not worried about his unresolved contract situation. In the final year of his current deal, Pearson has guided the Foxes back to the Premier League as Championship title winners. The 50-year-old, in his second spell as City boss, has the best winning percentage in the club's history. Nigel Pearson has the best winning percentage of any Leicester manager over both spells as boss. * Statistics courtesy of Leicester City historian John Hutchinson. 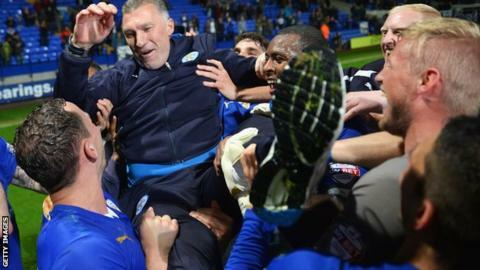 "I'm as relaxed now as I was when I was first asked about it," Pearson told BBC Radio Leicester. "You can't ever make absolute assumptions on things, but I'm confident that things will be sorted out very shortly." With two games remaining, the Foxes are still looking to set a new club record for total points won, having already broken the club record for most wins in a season (29), consecutive wins (nine) and most consecutive games unbeaten away from home (12). Their run of 21 league matches unbeaten between December and April was also a club record in the second tier. Pearson and nine City players, including goalkeeper Kasper Schmeichel and Lloyd Dyer - who scored the goal to seal the Championship title at Bolton on Tuesday - are yet to agree new deals with the Premier League-bound club. The Foxes boss answered questions about protracted contract talks in October and has repeatedly insisted that he will keep faith with his current squad when they return to the top flight after 10 years next term. "I fully expect us to make real progress in the next few weeks, and I think that is important," said Pearson. "Everybody involved here would like to be involved in the next step - we have worked very hard to achieve success this year."